These EtherStax I/O units provide a rugged, high-density, and high-speed solution to interface a large quantity of analog input signals as this Unit accept 16 single-ended analog voltage inputs and 16 single-ended current inputs. In addition the ES2152 also provides 16 analog voltage outputs. 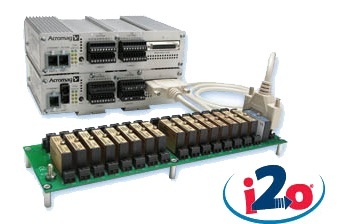 Two DB25 ports which support an alternate interface of voltage I/O from 8B input or output modules. This combination of high-density analog inputs and outputs is ideal for many sensor interface applications in remote zones. – 16 single-ended analog voltage inputs and 16 single-ended analog current inputs. – ±5V, ±10V, ±20mA, 0-20mA, or 4-20mA DC. – Floating Point Format: IEEE-754. – 16-bit maximum, 0.00166% (1 part in 60,000). – Current Input: Better than 0.1% of range. – Voltage Input: Better than 0.05% of range. – Voltage: 4M ohms minimum. – Eight user-enabled 4-channel scan groups. 770µS update/group (5mS for all 32 channels) with averaging, loopback, and totalization functions disabled. – Bipolar Transient Voltage Suppressers (TVS), 18V clamp level typical. – CMR (50-60Hz): Better than -72dB. – 0-500 samples. One register for all channels. – 16 DC voltage outputs. – ±5V, ±10V DC (at ±1mA). User-configured on a per-channel basis. – Resolution (±10V): 16-bit maximum, 0.00166%. – Resolution (±5V): 15-bit maximum, 0.00305%. – Accuracy: Better than 0.05% of range. – Failsafe or non-failsafe (user-configurable) relay trips on power or link-loss failure. – SPST-NO, 1 Form A, Class I, Division II approved. – 3A @ 24V DC/250V AC, 100,000 cycles general. – 2A @ 24V DC/250V AC, Hazardous locations. – 250V AC / 750VA, 125V DC / 90W. – User-configurable as a true switch (default mode) or low-latency hub. – One or two 8-pin RJ-45 connectors. – Automatic MDI/ MDI-X. 100m communication distance. – One multi-mode with SC connector. 2km communication distance. Full/half-duplex, selectable. – Modbus TCP/IP, UDP/IP, i2o peer-to-peer. – Compatible with STP, RSTP, or any ring scheme. – Operating: -40 to 70°C (-40 to 158°F). – Storage: -40 to 85°C (-40 to 185°F). – 18-36V DC. Redundant, diode-coupled terminals. – 4.8W (copper ports), 5.8W (fiber-optic ports). – I/O, power, relay and Ethernet port-to-port. – Continuous: 250V AC, 354V DC (150V AC ch-ch). - CE marked and UL/cUL Listed. – Hazardous Locations: Class I; Div 2; A, B, C, D.
– Open board units: UL Recognized. – Mechanical Shock: 50g (3ms), 30g (11ms). – Random Vibration: 5g, (5-500Hz). All units have 32 inputs,16 AC/DC outputs and i20 peer-to-peer communication capability.